Four years ago, my brilliant sister Marjorie was taken from us by breast cancer. It had come back a second time, in a more extreme fashion. After several years cancer-free, breast cancer cells came back inside her bones. It was no contest. Cancer won. There are many who conquer it, but so many who don’t. In their memory, we walk, run, wear pink and donate to research foundations. And we grieve. I’m writing this article at the end of Breast Cancer Awareness Month, because it took me all these days to sit down and write this. Because this isn’t just another web article, it’s personal. But there is an upside to grieving and pushing the deadline and it’s that I’m keeping the month active. Breast Cancer Awareness Month isn’t over just because we donned all pink last weekend and walked all over Manhattan for two days. We’ll always remember our loved ones. Their love is always in our hearts. As October fades, we can still support companies that have made an effort to raise money for Breast Cancer research and patient care. Excellent products are still on sale. The sassy ColorMe by Giuliano, a professional, temporary hair color, has come out with a vivid color for the month named – you guessed it! – “Pink Ribbon.” It comes in a mascara-sized bottle with a stiff round brush at the tip of a pull-out wand, perfect for broad swipes or just a touch. This sweet hot pink tint will honor Breast Cancer Awareness Month’s final days and definitely make Halloween more fun. The word “Cure” is printed on the side of the bottle. Go on and color your luscious strands! It dries quickly, but washes out easily. Best part…ColorMe donates $1.00 for every bottle sold. You can get it at http://www.colormepro.com and at fine salons. 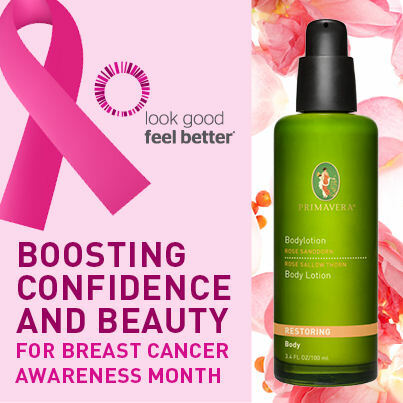 PRIMAVERA, a German-based line of beautiful skincare and aromatherapy treatments is commemorating Breast Cancer Awareness Month by donating 75% percent of online sales of its divine Restoring Rose Sallow Thorn Body Lotion to the Look Good Feel Better Foundation throughout October. The organization provides support and techniques to cancer patients who need to be confident in their natural beauty. Purchases must be made on the brand’s website, http://www.primaveralife.com. The lotion’s floral notes from rose water and rose essential oil make it a bliss-evoking treat. The natural, organic ingredients ignite a renewal of cells and strengthen the skin’s moisture barrier. I love the softness it imparts. PRIMAVERA’s philosophy says: every day is a chance to bring nature closer. The ingredients, like olive oil and rose hip seed oil, indeed make this the closest thing to a branch to bottle skincare treatment – no gardening gloves needed! Lastly, let’s acknowledge a beauty and skincare brand that’s legend in the community. Avon. What Avon accomplishes annually is pretty unbelievable. Never walked with Avon? Try it in 2014. It now walks in eight different cities, making it a travel adventure for visiting participants and a pink blur for everyone else. According to the Avon Walk for Breast Cancer site “$472 million has been raised and donated to breast cancer programs since 2003.” That’s astounding and joyous news. Avon has additional ways to raise funds. Thinking about holiday gifts? At http://www.avonwalkshop.org, you’ll find a vast selection, including the Breast Cancer Watch, designed with pink or black embellishments. Let me tell you, Santa knows what cause is naughty and that Avon is nice! Don’t let the month end without showing some pink. And buying gifts. Breast Cancer is a giant beast, but we’re going to give all we’ve got to slay it. and Be Entered to Win a Trip to the Academy Awards!